This handsome natural wood gift crate is filled with essentials for the stylish guy in your life. 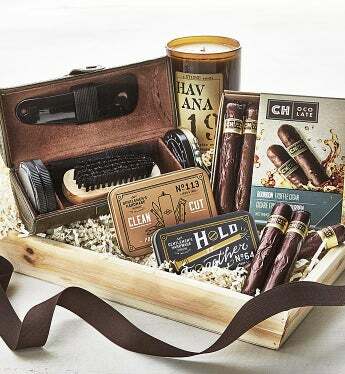 Your well-groomed guy will love the leather travel shoe care kit, the Gentlemen's Hardware pocket manicure tool & cuff links & tie bar set and the Havana 19 reclaimed beer glass candle. And you'll make his day with the premium bourbon truffle cigars! Kloud City Travel Shoe Care Kit - This handsome kit includes brush, cloth, shoe polish, shoe oil, and shoe horn, all packaged in a leather tubular case. Perfect for business or leisure travelers or for at home use. Gentlemen's Hardware Clean Cut Pocket Manicure Tool - This pocket-sized tool includes nail clipper, scissors, a nail file and a mini carabiner, which is perfect for a key chain. Gentlemen's Hardware Hold It Together Cuff Links & Tie Bar set - This vintage style tin holds a set of screw top shaped cuff links and a nail shaped tie bar for the ultimate in do-it-yourself style. Havana 19 100% Vegetable Wax Candle - this 16 oz candle is stylishly presented in a reclaimed beer glass bottle. The scent is an intriguing blend of black pepper, fresh ginger, sparkling orange & grated nutmeg fused with a heart of warm orchid vanilla, richly supported by patchouli, cedar wood and sandalwood. Chocolate Signatures Bourbon Truffle Cigars - a box containing elegantly wrapped dark chocolate cigars infused with a bourbon truffle center.